Just in time for Easter, Mother’s Day, or the everyday, create a mini scrapbook album/journal any awesome mama or grandma will adore. Want the album all to yourself? No problem! Your colorful class kit comes loaded with enough supplies to make a second book, including a set of paints, a tag-shaped pad of watercolor paper, a gorgeous floral stamp, and more! You'll use your goodies to learn several unique watercolor techniques and tricks that can be applied to all sorts of paper crafts. Of course, it wouldn’t be a class with Megan without plenty of door prizes to go around. Woot! Unleash your inner artist and experience the joy that comes from painting and paper play. Plus, you’ll get to experience Utah’s newest paper shop, Posh Paperie at Gardner Village, which is too cute for words! Christmas is my favorite card-making season. But it also happens to be a very busy time, which can make finding time to make cards for those I love difficult. This doesn't mean we have to be mean ones, Mr. Grinch. Instead, we simply have to apply my favorite bulk-card tips to quickly create cards that will be remembered and won't break the bank. Whether you purchase the DVD or join me from the internets, this class is loaded with tips, ideas, and fun. Hope to see you there! Click here to watch the preview video and learn more! 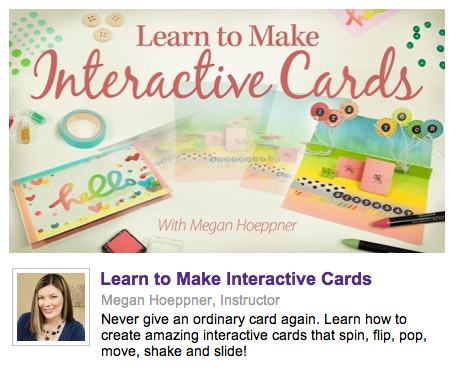 I'm delighted to announce the debut of my class, Learn to Make Interactive Cards, with Annie's Online Classes (Annie's Publishing). This affordable online class walks you through 10 interactive designs--cards that pop, spin, shake and more! And it's only $19.99 (for 4.5 hours of instruction, tips, tricks, innovative techniques and more)! Whether you watch from your computer or purchase the DVD, I assure you this is a fun one. I hope you'll join me as I enjoy ideas covering one of my favorite creative topics--card making! :) Thank you for your interest and support! For more info on my class and free video preview, I invite you to visit my class on the Annie's classroom site. Thanks! Every day, so many of us are documenting our lives via our social media activity. From Facebook and Instagram posts to Pinterest play, the things we share through our Social Networks are actually snippets of our lives being documented. Don't let those moments get lost in the online shuffle. Instead, turn them into beautifully documented pieces you and your family can have and enjoy for years to come. Search #HoeppnerLive on Instagram for more on my class. Thank you! In App to Archive, I give you two full days of amazing ideas for taking your memories, your LIFE, out of the "cloud" and into your hands. The class includes numerous tips for printing, organizing, and even posting content, as well as project ideas and fresh crafting techniques you can use with that content you've pulled. Learn how fun and easy it is to make Instagram calendars like this using a few simple tricks on your smart phone. And the best part—this is an online class! This means you can watch as your able, on your schedule. And you can watch as many times as you'd like. Awesome! Learn cool techniques for altering divided page protectors to make your own signature pocket inserts to use in your scrapbook/Project Life album. Preview (including free 15-min. video) class and purchase here.